Ouija spells F-U-L-D-F-A-M-I-L-Y-F-U-N! The board is said to be “more interesting than a mystery story,” I couldn’t have said it better myself. Last month I had the amazing opportunity to help promote the new movie and Winning Moves’ Ouija Classic when Jeff Belanger and I spoke at an event for them in Salem, Massachusetts. I finally got to meet Irena who handles marketing for Winning Moves. She was awesome! She introduced me to her husband Steven who used to work at Parker Brothers. He had some great stories to share. And then he dropped a bomb. He said that when Hasbro bought Parker Brothers in 1991 and consolidated its files it threw out a bunch of stuff. I’d heard this before and it always makes my heart sink. He saw the look on my face and said “Yup, they threw out a ton of stuff but I did save one piece of Ouija artwork, if you’re interested in it I could mail it to you?” I was dumbstruck, hell yeah I’d love to see it. So, we texted back and forth a few times and the following week the artwork he sent, arrived. I nearly fell off my seat when that iconic image of a man and woman came into focus! Here's a better look at that picture (below). That’s not a print; it’s the actual drawing. Now the backstory and why this piece of original Ouija artwork is so spectacular. In 2002, I had another amazing opportunity, the chance to meet and interview the 89-year-old, Hubert Fuld. Hubert was the youngest child of William Fuld, the last president of William Fuld Inc., and the man who sold the Ouija board and his company to Parker Brothers in 1966. During that meeting he told me something super cool - his older brother, William Andrew Fuld, drew all of the artwork for their Ouijas and Mystifying Oracles. In fact, he told me that one particular photo taken in 1933 of Hubert and his secretary, which was used for marketing the Electric Mystifying Oracle, inspired one of William Andrew’s drawings. Turns out it’s the very one Steve rescued from the trash at Parker Brothers! That photo is on the top left. So according to Hubert, that’s him and his secretary in the drawing too…penned by William Andrew himself! 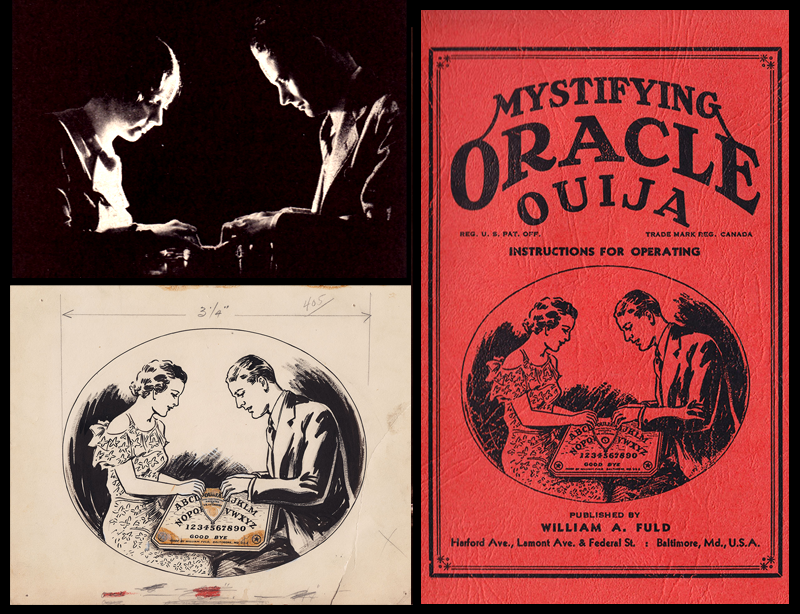 The orange Mystifying Oracle booklet dated 1936 and the accompanying board’s box were the first to feature these two playing Ouija. 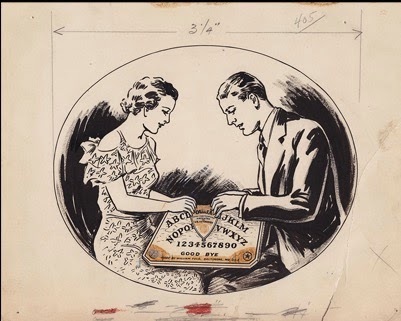 This artwork ran continuously on Ouija and Mystifying Oracle’s boxes until 1966 when Parker Brothers would revamp and update the couple. So, if Steve hadn’t worked for Parker Brothers, picked this out of the trash, married a woman who eventually worked for Winning Moves, who happened to be overseeing the event I was asked to be part of, this amazing piece of Ouija history would be sitting in a drawer or worse incinerated with the trash back in 1991. Everything lined up so perfectly for this to work out the way it did that sometimes even I think Ouija might be looking out for me. Thank you Steve & Irena, Winning Moves, and all the spirits of Ouija Past Present and Future. You all played a role in saving a seventy-eight year old piece of artwork that’s helped spell M-Y-S-T-E-R-Y for generations.